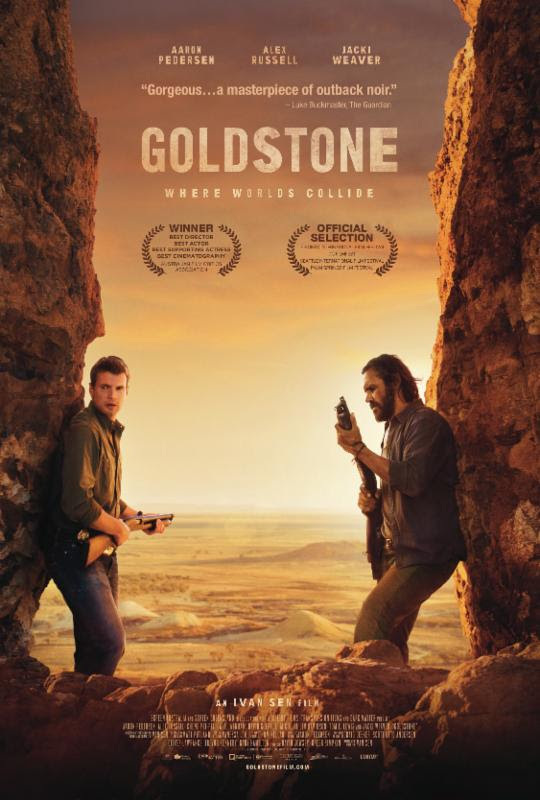 Goldstone is an Australian film from Ivan Sen starring Aaron Pedersen, Alex Russell, Jacki Weaver, David Wenham, and Michelle Lim Davidson; about a detective named Jay Swan (Pedersen) that find himself in the small, desolate, country town of Goldstone, much to the dismay of the locals, in an attempt to sole the case of a missing girl named Mae (Lim Davidson). It is there that he runs into opposition as he soon discovers that a missing girl is just the tip of iceberg. Things like trafficking, corruption, and land rights, are just some of the things that his unwanted and intruding presence threatens. In an attempt to shake up the status quo and bring justice to the small town, the fight rests in the hands of Jay and a young, local cop named Joshua (Russell), two people who couldn't be any more different from each other. This isn't one of those kinds of gritty, cop, crime dramas that we've seen time and time again. I do think that given the description that I gave that some people would get that idea. Though it does fall victim to some of the same tropes it is a lot more quieter and subdued and the description of it being "'a Neo-Western crossed with Outback Noir" couldn't be anymore on the nose. The film, I must say, is a bit slow especially in the beginning, However, once we, the audience, learn that there's more to this town than meets the eye it does pick up a bit. With that being said I do think that the overall slowness of the film may work against it in some people's eyes. I think that the characters in this film were one of the more noticeable flaws; I thought that they could have been a bit more developed. When we first meet Jay Swan, he's arrested for driving drunk, but after that one incident the film never toys around with that vulnerability in the way that you would think that they would. By the end of the you're left think to yourself "What was the point of showing him that state if it wasn't going to be explored more?" We never find out why/how Mae went missing. We also never find out Joshua's motivations for being a cop and putting himself in this corrupt world in the first place. Maybe it wasn't integral to the story at hand, but it still would've been nice to know these things. I also found the development of a character named Tommy to be poor. One minute he's a bad guy and the next he's not; it just left a lot to be desired. The thing that surprised me the most and I would have to say is my favorite thing about the film is its message. The film explores the idea of trying to make a difference. No matter one's view on corruption, trafficking, land rights, in this small town of Goldstone, those are some of the things that keep the town running. People go there initially and may be morally righteous, but after a while they like everyone else fall victim to those same corruptions because that's just the way things are; "the world is not made for you, you were made for it" and it's all about figuring out where your place is. Because of that mentality and also the consequences that come from one's need to be a savior of truth, that is what stops any real justice from taking place; people are too scared and caught up in their own ways and ego to even try to think about making a difference for the better. I like that this film not only explores that, but also makes a definitive statement about it when it's all said and done. Though, this isn't one of the best films that I've seen, there weren't a ton of flaws that completely turned me off from it. I also like that is made me contemplate that idea of standing up/fighting for what's right vs. just staying in line so as to not upset the status quo and the powers that be. I could sit here and say, as I'm sure a lot of people would, that if I/they found ourselves in a situation that brings up that dilemma that would the do the right thing, but the truth is is that thinking that you would do something vs. actually being in a real situation where the pros and cons are very visible and tangible and the decision actually has to be made are two completely realities. We truthfully do not know how we would react and I like that this film (at least for me) made me aware of that and made me question my own morality in the process. We need more films like that.